What a wonderful thing pregnancy is. The beauty, the miracle of bringing a child into the world. It's not all fun and games, though. Any woman who has given birth and any man who has lived with a pregnant woman, knows what I'm talking about. Something that directly affects the mood of the pregnancy, is a woman's raging hormones. She can't help it. A pregnant woman's body is a wonderland. It does things that no other body type does. Hormone levels are all out of whack with my expecting wife. One child can do some damage to a lady. Two babies change everything. Double trouble! I'm no expert and don't claim to be. I'm just writing about my own personal experience and my observations. Living with a pregnant woman is hard work and I know I'm just as much to blame as anyone. I got her into this situation. I know that. I wouldn't change a thing about it. I'm so excited about my beautiful princesses arriving soon. Every day is a new challenge though. You're never fully prepared for most things. Yes, I am a father of two children already but every pregnancy is different and there's no way to compare one with another. The other night, my lovely wife started crying over something that normally wouldn't have phased her. It wasn't anything that I saw as a big deal but I comforted her, nonetheless. It's difficult as a man to see something bothering your wife and not having any way to fix the situation. I wanted to kiss it and make it better. I know that's not possible. In the end, all she really needed was to vent and for me to listen. I'm not a perfect father or a perfect husband but I try to be the best I can be and learn from my mistakes. Sometimes, that's all you CAN do. 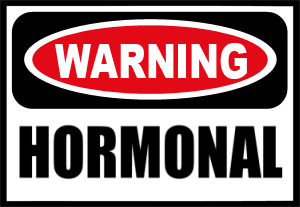 I understand that the hormones are only going to get crazier as we go along. This amazing woman, I'm blessed to call my wife, has been so awesome carrying our babies. She has the hormones (and emotions) of THREE females and has dealt with it so well. I think if you asked her, she would tell you that I've been supportive. I have work to do. I can, and will, continue to improve. I'm learning more and more every step of the way. Someday, I will be able to give some advice to my sons on what to expect living with a preggo lady. I will tell them that patience is a must. You WILL be challenged. Never forget that no matter what you think you're going through and how bad you think you have it, your wife has it worse. She's the one with the changing body. She's ALWAYS uncomfortable. She can't stand up comfortably. She can't sit down comfortably. She can't lay down comfortably. Sleeping is almost impossible for her. She pees nonstop. We may have to replace our toilet if she gets much bigger. Kidding. Sort of. She has taken it all in stride. She's doing a fantastic job. She is one of the strongest women I know. That's why it's so hard seeing her so emotional. Normally, Karyn isn't a very emotional person. She's very even keeled. This part of the journey, like everything else, will pass. She'll always be my rock. To new fathers or expecting fathers, a little advice. Take care of your wife. Love her unconditionally. Even when things aren't going the way you expect them to. She's just as, or even more, lost and confused as you are. Everything you feel, she feels x10. Understand that what she's going through for your family is the greatest blessing on earth. An experience that's beyond our understanding. Even the fact that her blood increases by 50% while pregnant is baffling to me. Be nice. Even when she's not. She can't control a lot of her actions but you can control your reaction. Hold her, kiss her, and let her know every second of every day that you love her and you are there for her. And you better actually be there for her. With these raging hormones, there are a lot of judges that wouldn't convict her of murder. Think about it. Continue to pray for me. That God gives me the wisdom that I need. Most of all, pray for Karyn. Two girls growing inside of her is stressful enough. Dealing with the thyroid issue just compounds things. Being away from family and friends who are out of state is very hard for her. She needs all the prayers that she can get. I pray that she has very little stress in her life right now. For the safety of her and the babies. We have a strong family. Friends and family that pray. With God, ALL things are possible. Even me surviving this pregnancy with all limbs intact. I really want that to happen.